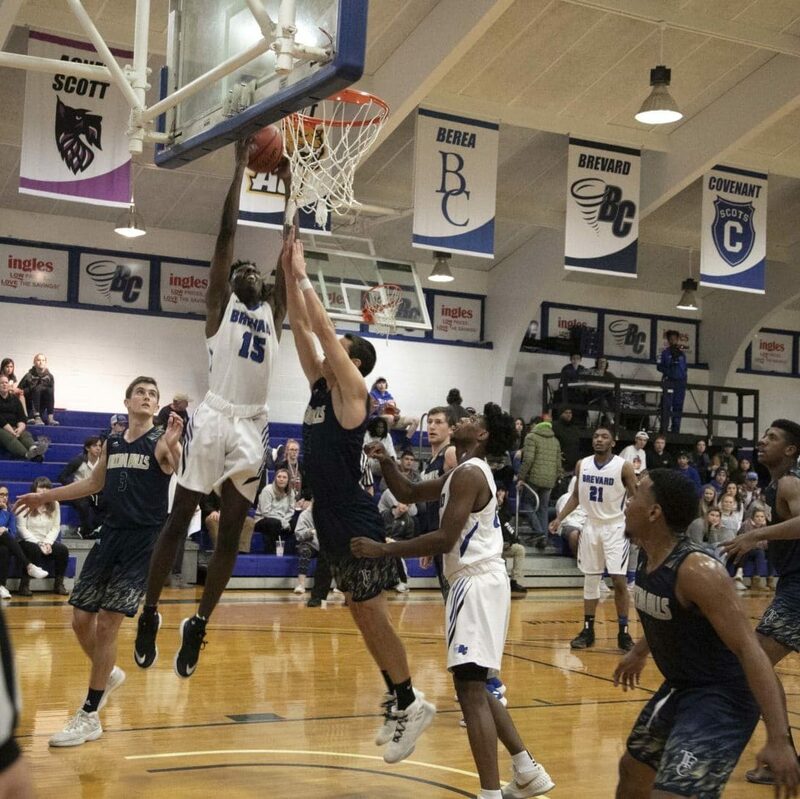 A 13-2 scoring run in the final 1:38 of regulation helped the Brevard College Tornados Men’s Basketball team storm past the Piedmont Lions in overtime by a final score of 78-73 at the Brevard College Boshamer Gymnasium. Levi Lamb led the way for the Tornados with a game-high 24 points on 8-of-15 shooting, which included 6-of-7 from the charity stripe. Lamb’s 24 points match his single-game career-high total. BC’s bench played a large role in its success, tallying 36 points overall. Cannon Lamb tallied 13 point, grabbing five rebounds and dishing three assists in reserve action. Freshman forward Noah Lea recorded 13 points and two steals. Sophomore guard Demari Hopper rounded out the Tornados’ double-digit scoring efforts with 11 points. Hopper also grabbed a team-high six rebounds. Turnovers cost Brevard mightily in the first half, as BC’s 15 mishaps led to 19 Piedmont points-off-turnovers. Coach Burgess’ Brevard College Tornados came out of the gates firing in the second half. Brevard used a quick 9-3 run to get back into the game. The Tornados continued to battle and even held a brief lead at the 12:31 mark, 47-46. Brevard and Piedmont continued their back-and-forth affair, as BC cut Piedmont’s advantage to just two points, 54-52 before the under-8 media timeout. Both teams would trade empty possessions before Wilson drew a foul, subsequently knocking down both of his free throw attempts to cut Piedmont’s lead to 66-61 with a mere 30 seconds left in the contest. Wilson would come up big once again for the Tornados, as the freshman forward from Eagle River, Alaska stole the Lions’ inbound pass and knocked down a layup to bring the Tornados to within three points at 66-63. The Tornados’ leading scorer would then take matters into his own hands, sinking a deep long-range shot with 11 seconds left in regulation to cut Piedmont’s lead to 68-66. Hopper found a cutting Levi Lamb in the paint, as Lamb’s layup found the bottom of the net to tie things up at 68-68, sending the USA South battle to overtime. Levi came up big for the Tornados in the extra stanza, propelling them with four quick points to give BC a 72-68 advantage. Piedmont’s Miles Riley converted an and-one layup to bring the Lions to within one, however the Tornados would pull away. Clutch free throws by Wilson, Levi Lamb, and Cannon Lamb put the contest out of reach, as the Tornados earned the victory in exhilarating fashion.